Where did my journey begin? I chose digital literacy as my topic to conduct action research on after witnessing my students struggling with these skills in my science classroom. So many of my students were not properly evaluating websites that they were selecting to use as supporting evidence in their projects. Students were using the "snippets" of information that google was providing them and never checking to see if that information was valid. I also saw many of my students struggle with basic search skills and how to determine if a picture was copyrighted or safe for them to use in a project. My first semester of research revolved around creating a unit that would strengthen some of my students digital literacy skills. Specifically I focused my research on my students' ability to evaluate digital media and websites for credibility. I conducted a pre and post test as well as designed a hyperdoc unit for my students to participate in and create an infographic demonstrating their learning. The hyperdoc was in the format of a gameboard where students completed the tasks around the board at their own pace. Within the hyperdoc that I designed, I incorporated many digital tools. Some of the digital tools I was very familiar with and knew that they worked well in my classroom. These tools included Google Form quizzes, Padlet, Edpuzzle and Brainpop. I tried a new tool in the digital literacy hyperdoc called Flipgrid. I had heard a lot of amazing things about Flipgrid and wanted to give it a try with my students. I had my students create a video of themselves explaining how to spot fake news and if they had ever had an experience with fake news. Some of my students LOVED Flipgrid and others were very hesitant to have themselves on video. I figured that maybe the nerves and hesitation were due to the fact that this was an entirely new tool that they were not familiar with. I also noticed that it took students several days to create one 30 second video, which did not seem like an effective use of time. After creating my initial Digital Literacy Hyperdoc, I noticed some reluctancy amongst my students in using a tool that I assumed would motivate them: Flipgrid. Flipgrid is a free website where teachers can create a topic online and students would post a video of themselves verbally explaining a response. It is simlar to a "selfie" video just like what students post on social media apps such as Snapchat in their personal lives. I figured that since students were SO invested in publishing pictures and videos of themselves to social media that Flipgrid would be the perfect fit for my middle school students. Boy was I WRONG! After several additional attempts at implementing Flipgrid into several more assignments, I continued to see a trend of students either opting out of creating a video (some even gave up an assessment score! ), covering their face, or acting inappropriate to cover up their nervousness. 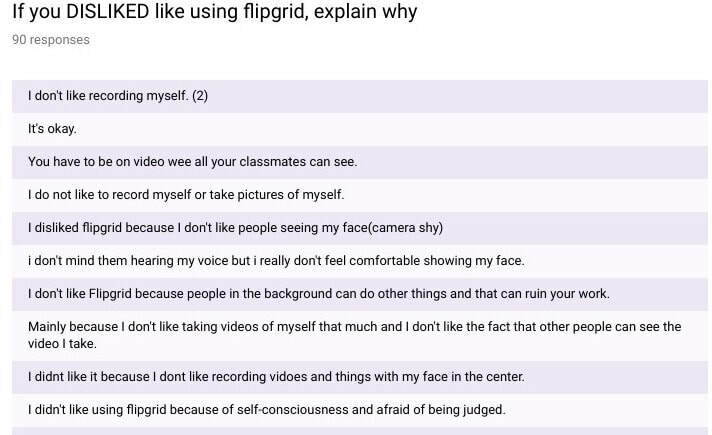 I surveyed students about the use of flipgrid mid school year and you can see the results below. Students rated using flipgrid. 1 represented "dislike it" and a 5 represented "love it." Students who rated the use of flipgrid as low had an opportunity to explain their reasoning for what they disliked about the program. There were a lot of students who were self conscious using a tool like Flipgrid where all of their classmates would be able to view a video of their face. As a teacher I witnessed some teasing amongst the students after viewing each others videos.